At Rulersmith, Inc. we provide superior printing by skilled screen printers. We put our printers through a highly specialized training program which allows us to print some of the most accurate and finely printed rulers on the market. 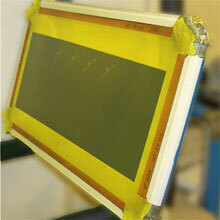 We do most of our printing on acrylic but are able to adapt to a variety of substrates. For a list of materials that we can print on please visit our Printable Materials page. Silk-screen printing - multiple printing technique, also known as serigraphy, involving the use of stencils to transfer the design.